Appalachia no seu melhor. A cabana de montanha recriados dentro do porão (primeiro andar, térreo) da minha casa para o seu prazer. Entrada privada (s), coberto deck / pátio, deck aberto, excelente vista, ambiente muito particular. O local tem uma orientação Leste-Oeste, com belos amanheceres e entardeceres. Ótimo lugar para sentar, relaxar e desfrutar da sua bebida favorita. A cabine é totalmente auto-contido. Tem a sua própria cozinha, banheiro com chuveiro (sem banheira), e uma pequena sala de estar / jantar. Um quarto com uma cama king size. Com uma localização central entre a I-40 e I-26, em Busbee Mountain, a propriedade faz fronteira com o Biltmore Estate e se mistura com a Blue Ridge Parkway a uma altitude de 3.346 pés. Animais de estimação bem comportados são mais do que bem-vindo! Fácil de reserva on-line ou com o proprietário usando verificação ou cartões de crédito. pequeno banheiro com chuveiro apenas, sem banheira. Semi Ambiente privado com áreas de passeios agradáveis. Dentro de um raio de 10 milhas é o Aeroporto de Asheville, todos os hospitais, centro de Asheville, Asheville Mall e compras, Biltmore, Arden, Fletcher, Skyland, Fairview, a Blue Ridge Parkway, The Biltmore Estate, Chimney Rock State Park, Lake Lure. We had a wonderful time at this lovely little cabin. It had everything we wanted for a break from our busy work weeks. Beautiful scenery, quiet and peaceful, and very comfortable accommodations. George is a great host and full of lots of wonderful information. I will say that the road up the mountain is quite “breathtaking” for lack of a better word. According to George, the rule of thumb is that if you meet a car coming in the opposite direction, the car coming down the mountain is the one that backs up to a safe place to get over. Good information to know. :) We would definitely go back. Great host. Cabin was very cozy, perfect for a getaway weekend. The view was absolutely amazing. Definitely a repeat. Our cabin stay was outstanding. Pictures just do not do this place justice. The distance to downtown Asheville is outstanding, taking an approximate 10 minute drive on roads that compliment the beautiful Asheville views. A full view of the morning sunrise can be caught from the bed. The water from the tap tastes amazing, the shower was always hot, and the amenities were always accessible. Experiencing Asheville does not get any better than George’s cabin! This is an amazing property. 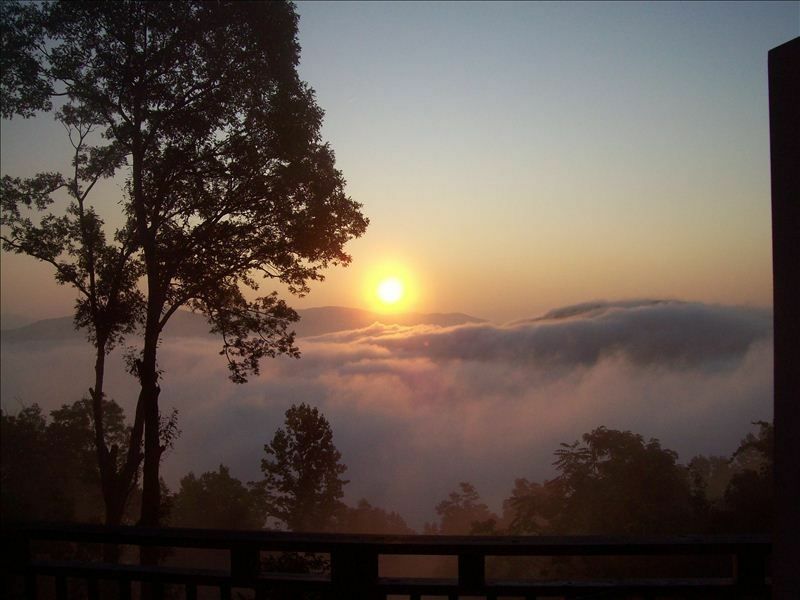 One can see both sunrise and sunset as this property is on a peak of a mountain. The cabin is perfect for a weekend getaway and so close to both downtown Asheville, the blue ridge parkway, the Biltmore, and many more local sites. We truly enjoyed our stay. The property is accessed by a single lane mountain road so one must be comfortable driving that. The Owner is truly nice and was wonderful to talk to. The views are worth the stay. We LOVED this place! Everything about it was amazing. The view was incredible. The place had a very cabin feel to it, which was exactly what we were looking for. The unit is totally stocked with EVERYTHING you could possible need, especially in the kitchen, which we really really appreciated. The location was perfect. It was in the mountains but close enough to downtown Asheville that we were able to uber to get some beer for about $15 and not have to worry about driving. George was super friendly and checked in on us to make sure we had everything we needed. I highly highly recommend. We love Asheville. We would totally stay here if we were to come back! The NC Sales tax, currently 7% is included in the $90 nightly rate. NO pet fees, NO cleaning fees! No additional charges.